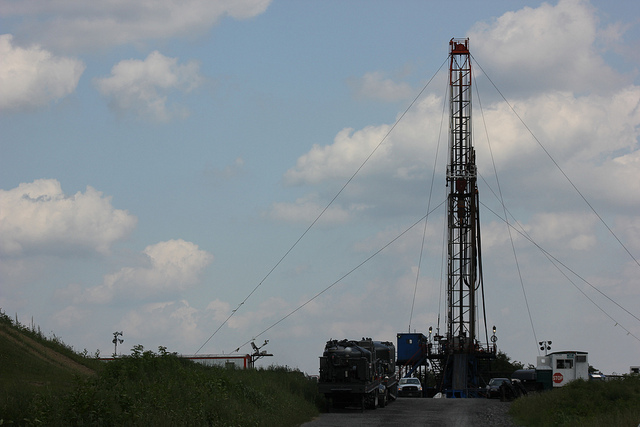 A Marcellus shale gas rig in PA.
As Pennsylvania’s natural gas production continues to expand, so does the possibility of potentially harmful methane emissions. A new study from scientists in the Environmental Defense Fund’s Oil and Gas program examined the most common sites for methane leaks at oil and gas pads nationwide. A team of researchers partnered with Gas Leaks Inc., a company that uses infrared technology to inspect well pads, to fly a helicopter over thousands of pads in seven regions in the United States. In total, the researchers flew over 8,000 pads in areas saturated by drilling, including North Dakota’s Bakken Shale and the Marcellus Shale in Southwestern Pennsylvania. The goal, according to a blog post from researchers involved, was to “better characterize the prevalence of ‘super emitters’” — the largest sources of the gas industry’s methane pollution. Results of the study, accepted on Tuesday in the Environmental Science and Technology journal, show that 90 percent of leaks from nearly 500 sources sprung from the vents and hatches, or doors, on gas tanks. The leaks were not a problem caused by old age, as emissions were more likely to be detected at newer wells. According to researchers, this is a clear indication that control systems already in place to prevent leaks are not up to par. Sign up to receive everything PublicSource brings you in one free email a week. The researchers suggest that better controls, like vapor recovery towers — tall pressure vessels that recover natural gas product that might otherwise leak into the air — be required at oil and gas pads. “Since this study found a higher frequency of detected emissions at sites within the first few months of production, controlling tank emissions as soon as a site enters production could reduce overall emissions,” the study reads. Methane is a greenhouse gas that can be fatal after long-term exposure; it is also one of the main components of natural gas. Industry — including the natural gas and petroleum sectors — is the largest producer of methane emissions in the United States. Pennsylvania is the second largest producer of natural gas in the country, according to the US Energy and Information Administration. Pennsylvania Gov. Tom Wolf and his administration have attempted to show that they are harnessing this growth responsibly. In January, Wolf outlined a plan for reducing methane emissions in the state. His plan, which included increased inspection of gas and oil pads, relied heavily on the state Department of Environmental Protection [DEP]. The DEP announced on Tuesday that it was restarting an initiative to make inspections more consistent, though the agency offered few details. Wolf said in a PennLive article describing his plan that preventing leaks was a goal with mutual benefits for both environmentalists and oil and gas companies. "The best companies understand the business case for reducing methane leaks, as what doesn't leak into the atmosphere can be used for energy production,” Wolf said. Pennsylvania state parks could see golf courses and hotels if this bill passes. Environmental groups aren’t happy about it. The Pennsylvania House of Representatives appears poised to move forward with a measure that could ultimately lead to a transformation of state parks. The Environmental Protection Agency has banned the practice of funneling fracking wastewater through public sewage plants nationwide — formalizing former Gov. Tom Corbett’s 2011 request to the industry to voluntarily stop it. The EPA established the new rule on Monday to address the potential of polluting the water supply with wastewater from hydraulic fracturing.